and Outdoor Parking * Our Low Rates do not include applicable taxes and fees. Internet coupons can be printed and presented to cashiers or scanned at equipment in the lane. You may also enter the promo code (found underneath the barcode on the coupon above) when making an online reservation on our website. Click here to make a guaranteed reservation. NOW ACCEPTED ON MOBILE DEVICES! Display the coupon to scan the barcode at equipment in the Lane! *Special discount cannot be combined with any other discounts, including AAA. 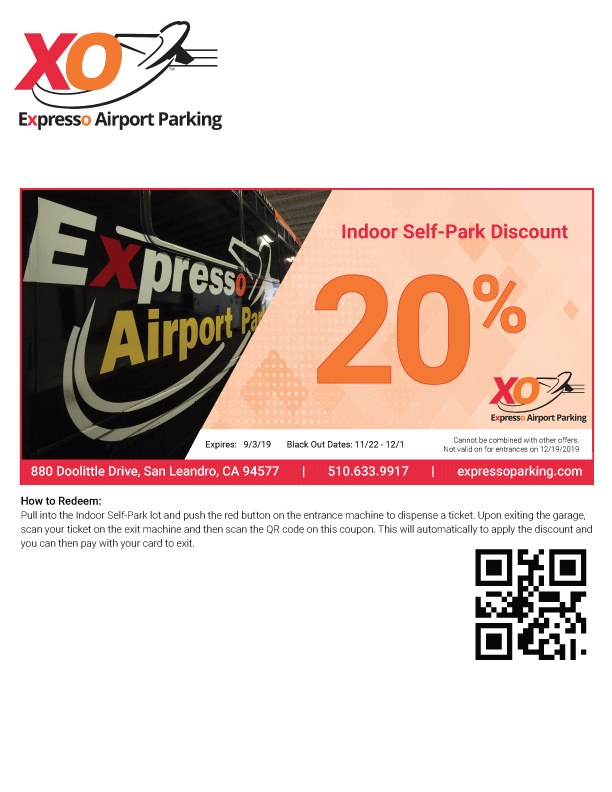 EXPRESSO AIRPORT PARKING AT OAKLAND INTERNATIONAL Why would you want to park anywhere else? Copyright 2017. Expresso Airport Parking. All Rights Reserved.